If you’ve tried to stop by the office, you’ve probably learned that it’s not as easy to get to as it should be. Most of the problem stems from disallowed left turns at Providence and Green Meadows, and Providence and Nifong. 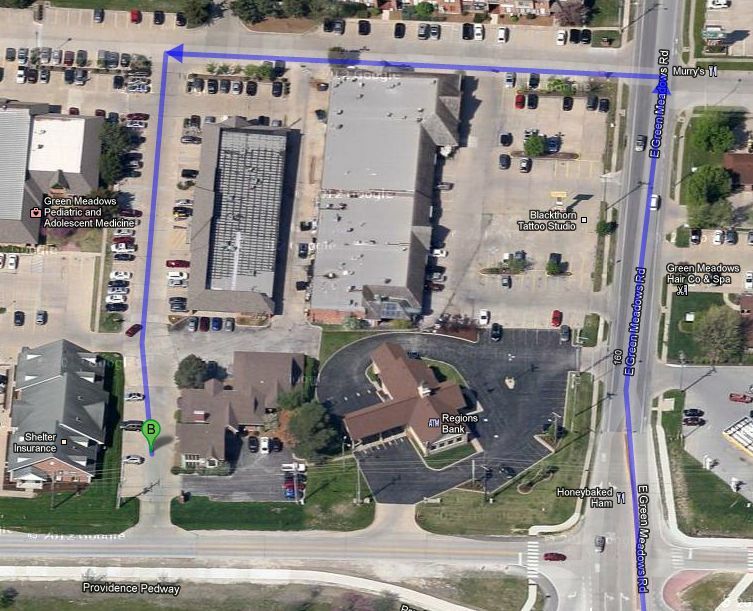 As a result, if you’re coming from the Downtown area (er … The District), you’ll have to drive through the parking lot behind Heavenly Ham to get here; and if you’re coming from the Rock Bridge area, you’ll want to turn right on the outer road at Nifong, rather than turning left on Green Meadows at Providence. With all the confusion, we decided to contact Google Maps and use the Google Map Maker to mark in the parking lot paths you’ll take to get here. Finally, everything has been approved and launched, and Google Maps will now take you straight to the parking lot, regardless of where you’re coming from. So, you can find us on Google Maps, or type in your address on our Contact page to get driving directions. Of course, if you still have questions, give us a call.